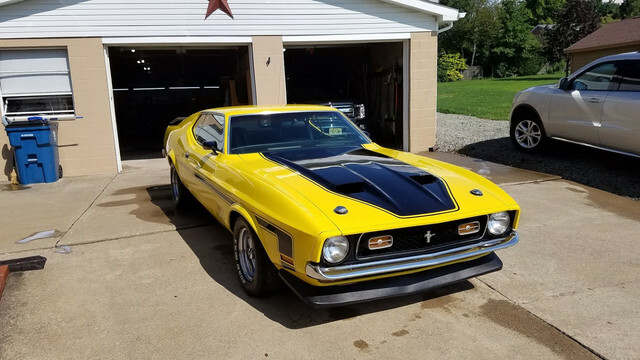 I had the Mach 1 out to stretch her legs on Sunday bu I had a hard time getting her started. The engine finally started to fire but it was real rough running and hard to keep at idle. I had to keep feathering the pedal to keep it running. It finally started to level out but still seemed to have a surge at idle. I let her run for about 45 minutes and then tried to go down the road but as soon as I tried to mash the pedal, the car spit and sputtered like it was starved for fuel. I don't think it is the fuel pump, I am leaning toward replacing the inline fuel filter. I have a clear Fram G2 on it now and it looks pretty old and the element is kind of brown in color. Do these symptoms sound like dirty fuel filter? Sounds like either fuel starvation or possibly a timing issue. More than likely the fuel though. (08-13-2018, 08:42 AM)73pony Wrote: Sounds like either fuel starvation or possibly a timing issue. More than likely the fuel though. Yeah, it was running fine about a month ago and then this happened since the last time I had it running. Hoping it is just a filter! Sounds like it might be the filter. The brown color may varnish from old fuel. How long since you put fresh gas in it? It might also be rust from the tank or fuel line. Check your crankcase oil level. If it is high might be fuel pump. When they go bad they usually pump lots of gas into your oil pan. If you have to get new fuel pump take your brake bleeder vacuum pump with you and check the new fuel pump at the part store. I got a bad one right out of the box last year. Depending on the age of the fuel pump the rubber might not be ethanol resistant. I changed the fuel filter and checked the oil level but it's still running poorly. Starts and idles but when I try to hold 1200-1400 rpm, it chokes out after a few seconds. Time for a pressure and volume test between the fuel pump and carburetor, either confirm or rule out the fuel pump or fuel delivery. In addition to the other possibilities, it might be the sock on the fuel pickup in the tank. Easy way to check is to disconnect the fuel line at the pump and drop it into a 1 gal can of gas. If it runs okay, then you have an issue between the pump and the tank. If not, it's the pump or carb. If it runs fine out of the can, hit the fuel line with some compressed air. That's blow the junk off the sock. To be honest, I've never seen a sock plug up from a car sitting such a short time. I'm betting there's crap in the carburetor. Reading through this, it definitely sounds like a fuel starvation issue. While I will never use a plastic or worse yet, a glass filter, the brown color may well be this issue I had just last year. It's likely RUST in your fuel line or from your tank. I use a steel inline filter (yes, I know it should be after the pump) between the apron and fuel pump. and last year the engine was running not at it's best. The filter was relatively new, but I couldn't even blow through it. I cut it open and it was full of rust. Time for a tank and line change. In your case I would use an inspection camera to look inside your tank. If it's clean it could be you line. I've posted pics before of what I found in mine, but here it is again...……. and this was a better part of it. In some spots, the rust was so bad the line just broke when I tried to bend it up to scrap it. Go for stainless 3/8", but be prepared to "tweak it" to fit. If you care to search, I did a full post on changing my tank and lines some time ago. Well guess what, I can't find that picture at his time. I'll post it if and when I find it. This is NOT to say rust is your problem, too many possibilities, but I found the pics I wanted. This is what your fuel lines might look like especially if you run Ethanol gas.